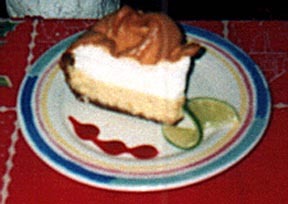 Servings: 6 Yield: "1 Pie"
Description: "Blue Heaven Key Lime Pie"
Mix the cracker crumbs, sugar and butter together. Line a 9 inch pie tin with the cracker mix, pressing firmly to line bottom and sides. Whisk the condensed milk with the lime juice and egg yolks in a stainless steel bowl. Pour into the pre-baked graham cracker shell. Set aside while making the meringue. Beat the egg whites to a soft peak - add cream of tartar and continue to whip to a stiff peak. Continue whipping and add the sugar, whipping until the meringue forms stiff peaks. Decoratively add meringue on top of the custard. Bake for 15 - 30 minutes at 350 degrees F.
Cook until the meringue has good color. Check with a wooden skewer or cake tester to be sure the custard is done. NOTES: * Be sure the bowl and whisk used to beat the egg whites is very clean, otherwise the egg whites will not form a stiff peak. Serving Ideas: Garnish with slice of lime.